Do you have questions about My E-mail Spider? No problem, we have answers! Q. What is Extract Fax Numbers? Q. How many fax numbers can I collect? Q. Can I really send fax messages... for FREE? Q. Will Extract Fax Numbers work on my PC? 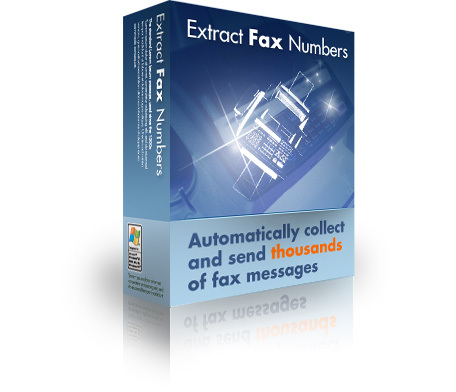 Extract Fax Messages allows you to collect thousands of targeted fax numbers from the Web, in just minutes! It works on a simple principle. 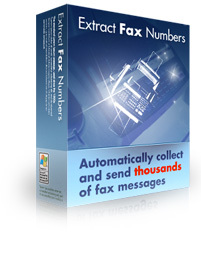 You provide Extract Fax Numbers with a series of search phrases. It then searches on those terms using Google and Yahoo! – then visits the resulting sites, scanning for fax numbers. It adds any it finds into its database, ready for you to send your fax message. Extract Fax Numbers also includes our exclusive bonus utility, “Fax Sender” – enabling you to send an unlimited number of fax messages to anywhere in the world, for FREE! Extract Fax Numbers is the ultimate in fax marketing. And when you buy before MIDNIGHT, Wednesday, January 30th 2019, it costs you just $19.95!! We don’t believe in limiting you, or charging you per fax number. Unlike competing products, Extract Fax Numbers does NOT limit the number of fax numbers you collect – or the countries you collect them from. Go wild, collect all week! Q. Can I really send fax messages… for FREE? Absolutely! With our exclusive “Fax Sender” tool, you can automatically send your fax messages to practically ANY number across the globe. You don't even need a telephone line! Simply paste in the numbers you wish to fax to, and the fax message you wish to send. Then click the button and watch as your messages are sent around the globe... in MINUTES! And there’s absolutely NO COST - EVER!! Most likely! Extract Fax Numbers works on any Windows PC with a connection to the Internet. If you’re reading this, that’s you! We’ll send you download links for EXTRACT FAX the INSTANT you place your order. There’s no waiting, and we’re open 24 hours a day! Our trial version runs for a maximum of five times, for a maximum of sixty minutes at a time. To download our trial version, please click here. Please note that the trial version does NOT come with the critical “Fax Sender” tool or Serif WebPlus SE. Yes! We don’t believe in charging you extra, just because we’ve dreamed up new features for our software. When you purchase Extract Fax Numbers, you’re entitled to 100% FREE lifetime upgrades and 100% FREE lifetime support. It’s all part of our total quality promise. We provide assistance via our dedicated support site. We promise to respond to all messages within one business day, however our typical response time is just four hours. We’re also routinely available for online chat support. To contact us, please use the support beacon at the bottom right hand corner.